Convinced that an object can never be as valuable as a direct experience, Fulton transformed his very life into a form of art. 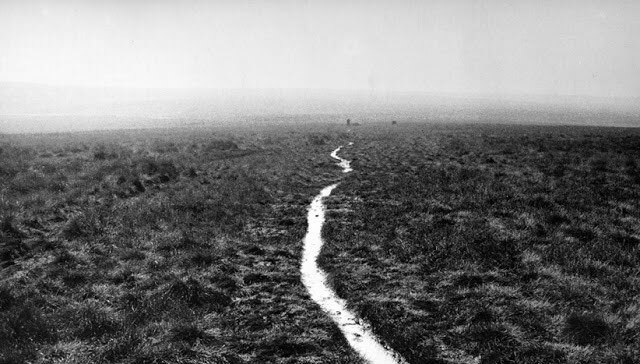 This ‘walking artist’, as he defines himself, therefore attempts to transmit the emotions and recollections of his solitary walks by means of photographs accompanied by captions with precise descriptions of the place, the route, its length, the time it took, the hour of the day or of the night. He may walk for days (A 21 days coast to coast walking journey, Japan 1996) or for just a few moments (Seven paces, 2003): it is nonetheless a ‘journey’ that is search and discovery and that in recent years he has chosen to also illustrate in the form of ‘wall drawings’ on the walls of galleries and museums, with words, numbers or short maps, creating images that often call to mind visual poetry compositions. This is a form of art that he refuses to define land art (THIS IS NOT LAND ART, ref. official website n. 1) and that transforms both the spatial dimension and the temporal dimension from subjective to objective (and therefore into an experience for the spectator).